Love the character. The smile is very mischievous. Apologies for the last few weeks. I was doing some art studies mostly on paper and didn't submit last weeks progress until this week as it was a bit basic and a bit naked. its still at the NSFW atm. hence spoiler tags. 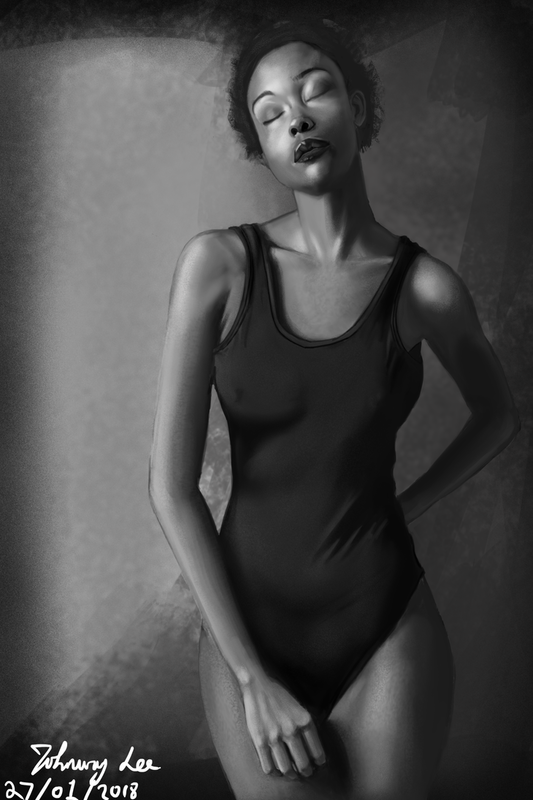 Anyway, new piece and originally, it was going to be anatomy study. specifically the female waist and hip area. I spent time looking through videos and comparing artists and how they approach the topic. Sadly no luck on that end. itching to get any work done i went for a generic pose. I had an idea in mind but it went out of the window pretty quickly. i spent last week on and off reshaping the entire body and arms to get them at an acceptable level. I wanted her to be holding a clipboard but the pose would have looked awkward, i tried books but that wasn't working either. Every ref showed them holding the books too tightly. Played around with the idea and thought maybe holding a tray? composition would have allowed it. The first is probably the one i'll use. just an update during the weekday. I've spent the odd hour testing and trying things to see what would work. I've referenced hot pants, skirts, mini skirts, pants and still struggling to come up with a decent idea. Not to mention hair styles that work with a round face structure. Well, i'll made some progress. its still very rough. 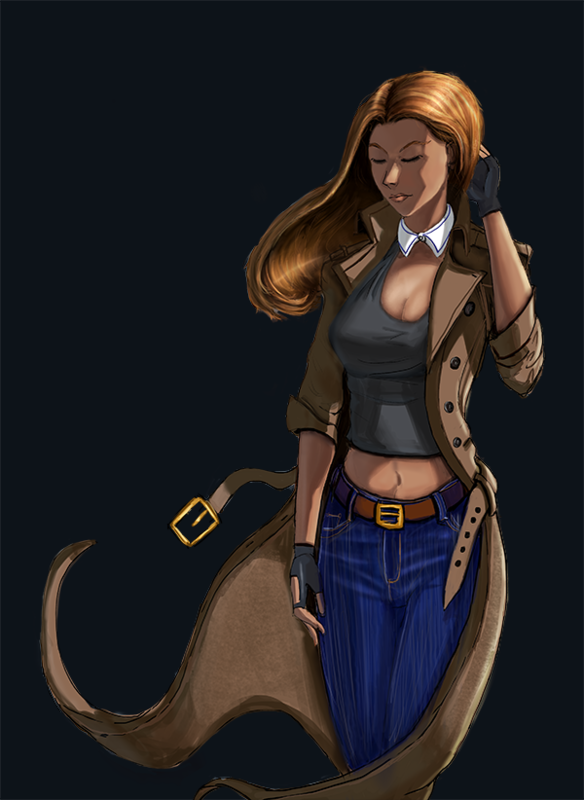 I'm tempted to take things further, address more pull folds, maybe adjust the skirt to be slightly higher/shorter, redo a bit of the shirt and certain address the hair. i'm all for suggestions and crits at this stage as i think i'm going to need to reink the whole thing anyway. More weekend work didn't do much today just did some final lines for my picture. My concern atm is that we've lost some of the detail especially in the eyes, hair and skirt. i'm thinking that i might consider ditching the lines and working on the roughs to maintain the energy of it. i dunno, i'll let you guys decide. I might go straight into coloring and see where that takes us. Weekend work and we've moving into colors. i decided to scrap the line work for the eyes and mouth and copy the roughs and use that as my lines. Anyway, we added the flats and added a background. I had hoped for more disco lights/lasers for added composition, but i couldn't implement it properly and shelved it. For now. i've begun adding the effects layers. Atm i've added the darkest shadows layer and the ambient (purple) lighting. Those are quick and easy to do in one layer and color. but adding the shading and lighting i might dial it back and do it in sections. i can't use a single color to complete all the shading or the lighting. But on the other hand, will the layer modes help to speed things up? Meh, i'll think about it. Either i find the solution or expect to generate a load of layers for each section. Crits and opinions welcome of course. more work this weekend. i think we've reached a roadblock, with multiple light sources in a darkish environment, its proving trickery and i'm not entirely sure how to go about this. i spent nearly 2 hours doing just the shirt alone and i'm note entirely satisfied with it. All the usual rules of engagement (mid tones, darker tones, lighter tones, shadows etc) went straight out the window within the first half an hour and working on instinct. Might play around with the color constructor to see what colors we get and what happens. Edit: i moved the eyes down a bit as it seemed like they were too high after adding the hair. Last edited by johnway : 11-05-2017 at 09:49 AM. Its my A/l so i'll be providing more updates in the following days. Anyway, we've moved onto the skin coloring. Its far from complete, i've just put in the base tones and ideas. We haven't done the shading yet and certainly not the color. i've been more mindful to reduce the number of layers i use now as its making my files nearly 1gb in size until i flatten the image. that doesn't happen until the end. Tomorrow, more skin work (we work on the dreaded hands...) and hopefully the skirt and glasses if i have a chance. ******* hands, man. What do they even do? A bit of advice to help reduce your number of layers is to flatten them as you no longer need them. So, if you have 2 layer with lineart, for example, once you're happy with it, flatten them. You can always add more layers later. Hi grieverjoe. Normally, i do flatten the layers and that is my main go to solution. But here's the problem, i'm using different layer modes and when i merge them together they all revert back to normal and breaks them and ultimately changing the painting altogether. its extremely annoying, i can't pinpoint why/where it does this as i merge the layers up sometimes its ok. I think merge visible maintains layer modes and everything is kept in place. the other option is Shift+Ctrl+Alt+E and create a new layer that way maybe. 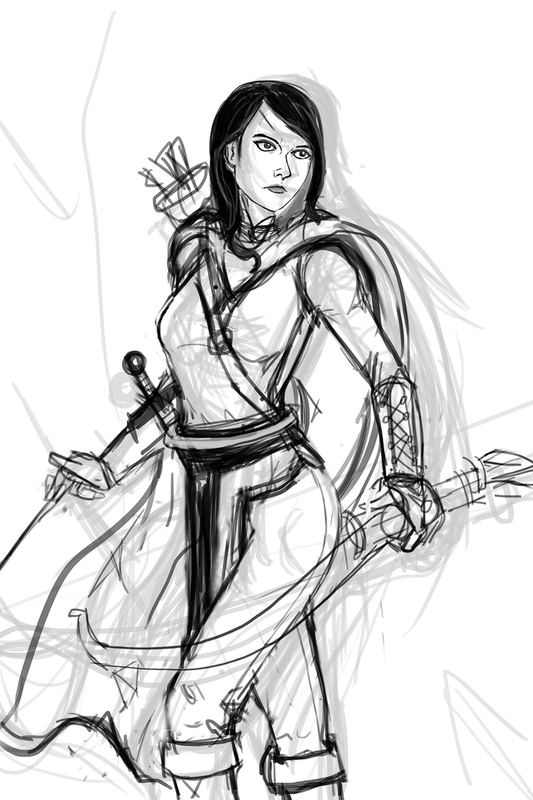 Ultimately, i'm just working on one layer now and making different layers when i'm unsure of certain changes. Anyway, apologies for yesterday, i was working on skin still. the hands are more or less done, but the skin could do with a bit more work before i finish it, so i'll move on to the rest of the clothing and hair before i work on the skin again. once thats done we'll add the magical layers and such. I might adjust the background to give it more depth. Somehow. Todays efforts. We've added the base stuff for the skirt/bra and worked on the eyes a bit. I had hopes to do slightly more, but i was called out to help my uncle cut some tree branches. So we're here. Tomorrow, we tackle the hair and it looks like a lot of work involved here... Might have to remove some of the lines and do some basic rendering. Once done, i'll address the lights and paint them away. although part of me wonders whether to get rid of all of them as it does look good with them. More work from the last 2 days. Some significant progress. We've done the hair, and the tray. We've made some adjustments to the skin and improved on areas. i'm currently thinking about the skirt, but a part of me wants to just say thats ok and walk away from doing it and work on the spit and shine post effects. namely removing lines and blending stuff together. Edit: I'm having doubts about those glasses. The bright colors detract from the main focal point of the female. My eyes are drawn to the drinks first and that is probably the wrong thing. I might need to go for something else. perhaps some dark/mute toned drinks or switch to a champayne and a few empty glasses instead? Last edited by johnway : 11-15-2017 at 06:15 AM. more work and i'm calling it quits. heres the final image. I had hoped to push the color values higher but i lost my nerve and went against it. now to enjoy the rest of my A/L. Apologies for the last few weeks. i've been studying other artists to see if i can learn anything. It doesn't help that i have also hit a sort of artists block for ideas. Not being getting any inspiration or ideas and it doesn't help if i try to think big, i don't have the skills to back it up and it all comes crashing down to boring poses. I had hoped to do more line art and do something good, but alas that hasn't happened this week. 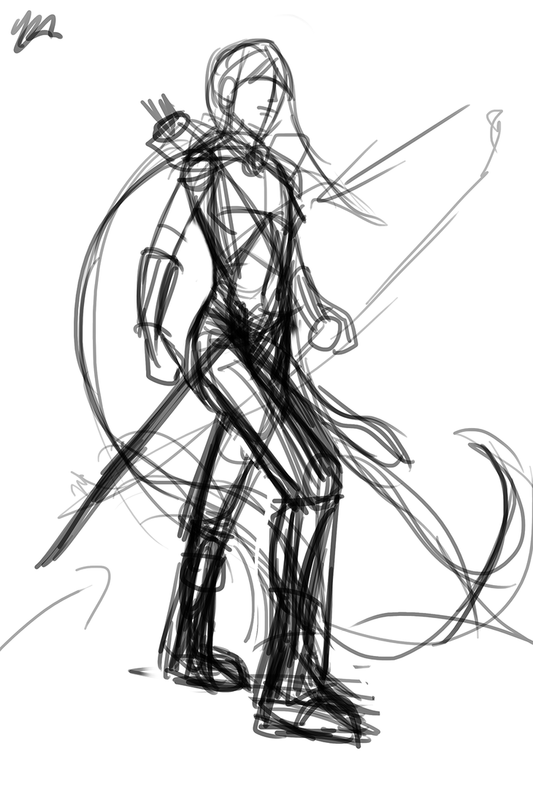 I might have to call it quits and ask around on how to draw complex poses and finding them. The only option is to probably to knuckle down get a doll or learn 3d or something. 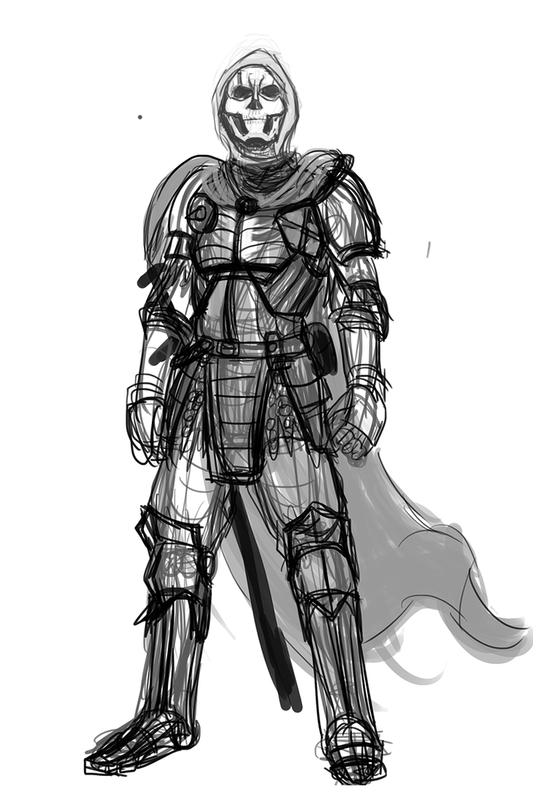 Atm, this is the rough from several hours or practice/drawing. Its not much and there is a germ of a good idea, but the stiff pose probably kills it. I dunno about you, man, but I'm digging the armor design. The skull-faced helmet is pretty sweet, too. i did like the design and would carry on working on it, but for now i've put it in the maybe pile whilst i see if i can come up with anything. Apologies for the lack of update. i had a lot going on and was suffering from a severe art block. Its not helped that every time i go onto this website i get threat alerts, it seems to happen both at home at work. Anyway, new pic and new plans. i was going to try and draw some fan art. Not exactly the best of ideas, but i after the last piece went so badly wrong i wanted to do something. Already hitting a few blocks finding a decent pose. Stole some poses from other pictures and tried to work on it. Its still very wip atm. My current dilema is how faithful i should be to the original. The original (seen at: http://defendersquest.wikia.com/wiki/Ketta) wasn't exactly that detailed, but again, need to remain faifthful as much as possible. This was the first option i drew. I took it slightly further to see if there was a germ of an idea here. i think the pose doesn't work for a long dress and we're already getting tangents. The second one more or less will suffer from the same thing. But its better. i might have to think about this and try a third, no thrills pose. Apologies for the last few weeks. Its been somehow a hectic christmas holiday whilst i spent the other half procrastinating. had a mental block that crippled my enthusiasm for painting. I'm just trying to power through it by doing odd sketches here and there and trying to get another complete piece sorted out. 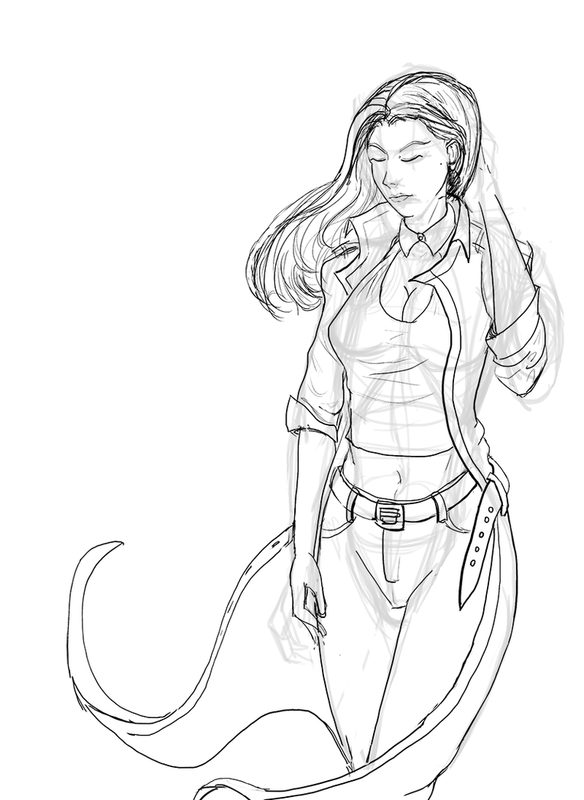 Below is some of the line art for another pic. Very much Wip, hair and clothing creases need to be added, sort out the hands. Apologies for the late replies. i was busy with other things and was feeling depressed again with artwork not going as smoothly as i wanted. Below is the (probably) final of the figure. not sure if i'm going to be doing a background image. Right from the start the image was looking shaky after adding the flats, i had royally messed up shading but i couldn't figure out why. but after talking to some people on discord someone was kind enough to do a paintover and i unashamedly took it for myself and applied it to the image itself. its not 100% perfect but i kept going as i needed to push through the art block and rekindle my enthusiasm. i did'n't do the face as i kinda lost my nerve and decided to leave it alone. It looks alright from a distance. Right? New pic this weekend and we're dialing back to practicing rendering using a ref. 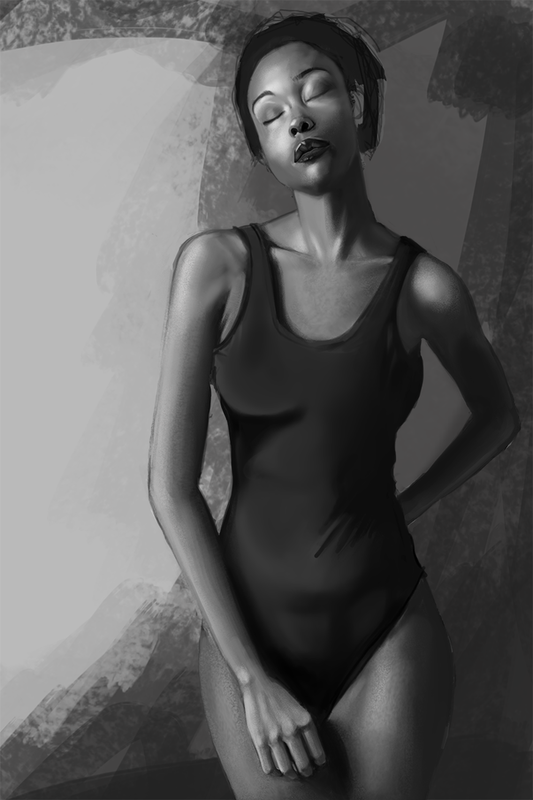 I chose an easy one for a quick victory, with a grey scale picture, easy tonal ranges and easy pose. today, i finished off the reset of the skin, i noticed that the skin was looking a little plastic and needed texture and i used a variety of hard/soft brushes with grainy texture at a low opacity and blending them back and forth to make the blend better and for an added bonus, i smudged it together and didn't make it so stark. So that's the skin more or less complete. I'll go back to skin later to refine things. but i'll need to work on the onepiece swimsuit, the hair, the ear and work on the background. More work continues this weekend just finishing off the image and general clean up.